James Robinson Mason was an early pioneer in northern Colorado. He settled along Buckhorn Creek where he raised cattle, was an active Democrat, and held a position on the school board. He visited Fort Collins frequently on business. And in 1896, he gave his name to a fledgeling town that was platted in anticipation of the population that would arrive once gold was struck in them thar hills. Mason’s rags to riches story flows from, and through, the land of opportunity that northern Colorado has proved to be for many over the years. James Mason first arrived in Colorado in 1863 at the age of 14. To hear Ansel Watrous tell it, the precocious young James loaded up an oxen cart full of whiskey in Kentucky and trundled hundreds of miles cross country to sell it to miners in the Colorado mountains. Mason was certainly an enterprising fellow, but based on census data from the time period, it’s possible that Watrous was embellishing his story a bit. The earliest details are a bit sketchy, but an 1850 census document from Hopkins County in Kentucky places James with two older brothers, Harry and John, and his parents, Asa (aged 30) and Mary (22). By the 1860 census, Asa is out of the picture, though through death or divorce is unclear. Mary now has five sons (Stephen and William were added to the bunch) ranging in ages from 18 – 9. And the family is living in Claytonville in the Kansas Territory. By the 1870 census, Mary has remarried to a man by the name of John Hager. Harry and John have moved on, but the three younger boys are still with their mom, living now in St. Vrain, part of the Colorado Territory. So if James had trundled out to Colorado with an ox cart full of whiskey in 1863, it’s likely his family trundled out with him. 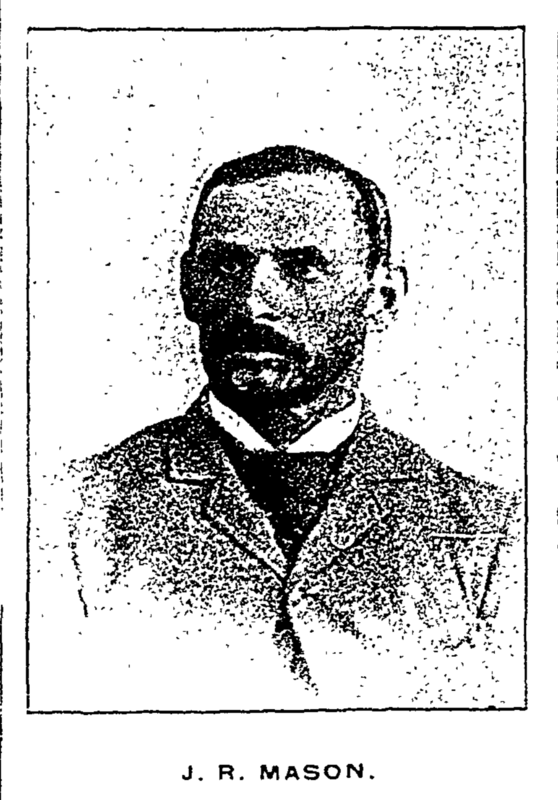 This picture of J. R. Mason was in the January 1, 1894 Fort Collins Express newspaper. The special edition focused on the notable people of Larimer County. Almost an entire page was devoted to James Mason. In the fall of 1866 he was sent into the mountains after a load of poles. A snow storm set in, blocking the trail so that he could not return and he was three days without a mouthful of food, what he considered the most gloomy period of his life. He has seen many stirring times in Colorado and endured many hardships and privations, but never before nor since has he felt the pangs of hunger so keenly as he did on that occasion. While living in St. Vrain, and traveling throughout northern Colorado transacting business, James met a woman by the name of Mary Maddox from St. Louis (a small community that predated Loveland). The two were wed on September 15, 1870 and had two children, Charles (1872) and Edith (1875). Mary passed away on May 28, 1876. She was buried in the Burlington Cemetery in Longmont. Her mother-in-law, Mary Hager, joined her a year and a half later. Mary Ann Flory was probably living in Greeley when James met her. The couple were married in August 1877 and together they had seven children: Jesse (1878), Birdie (1879), Wesley (1883), Vina (1884), Floyd (1886), John (1889), and Flora Mae (1890). 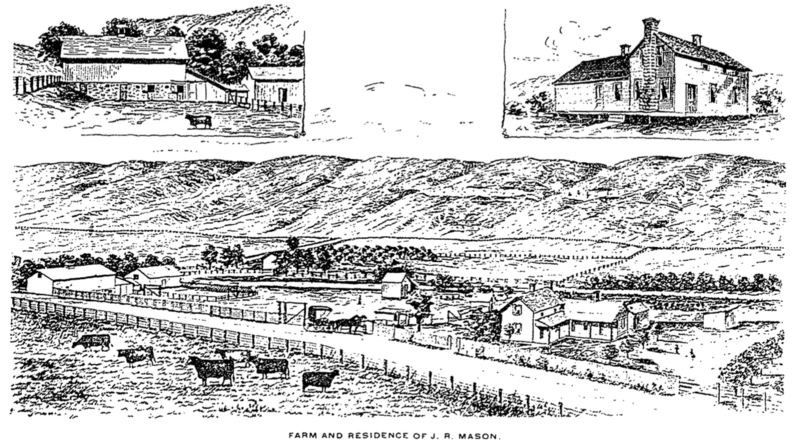 They lived in Longmont, but in 1885, James Mason purchased property in the Buckhorn Valley where he planted an orchard, grew grain for livestock, and began a ranching business. He bought and bred Red Polled cattle, being the first to introduce them to Colorado, and finding that they did particularly well in the climate, he was able to expand his business to a substantial size. The Buckhorn creek flowed through his property enabling him to easily water both cattle and crops. Mason built a house for his family using local wood and quarried stone from his property. It had hot and cold running water and furnace heat. His barn held 12 horses and 100 head of cattle. (And for a while, a Dunkard Congregation met there for services.) And over time Mason continued to add acreage to his property. 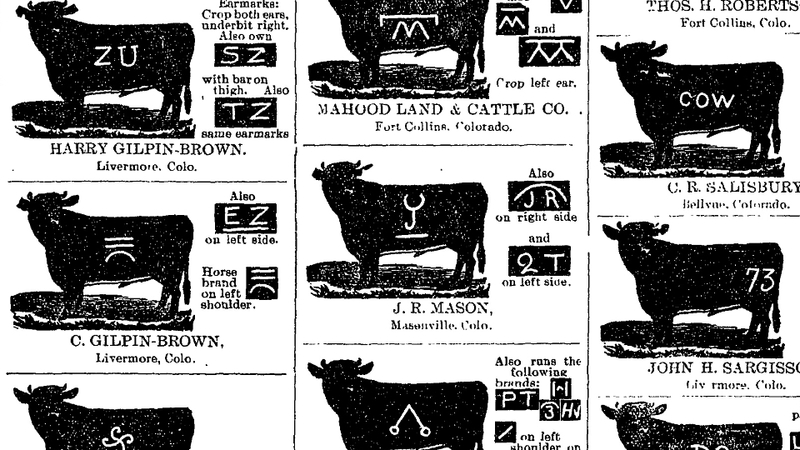 J. R. Mason’s cattle brand as found in the Fort Collins Weekly Courier from August 16, 1901. While Mason was prospering as a cattle rancher, the surrounding area was seeing a bit of excitement as well. Small amounts of gold had been located and prospectors were convinced that these finds were the start of something big. Land was snapped up by people hoping to strike it rich. As a means of preparing for the incoming population, F. M. Shaw, Edward R. Keyes, and J. R. Mason platted a town on a piece of Mason’s property, which they decided to name Mason City. They sent an application to the Federal government for the right to run a post office under that name and were told there was already a Mason City in Colorado and they’d have to designate the town under some other name. Hence, Masonville was founded in 1896. Despite the incorporation of the new town, other terms for the area continued to be used for several years. Camp Carter had been located in that general area prior to the founding of Masonville. But it was the names of Buckhorn (from the mountain and the creek), Arkins (from the nearby mining community), and Buffum (likely from the name of the postmaster, Oscar Buffum) that persisted for awhile before the community and neighbors became used to the idea of calling the area Masonville. “Last Monday J. R. Mason sold 80 head of 1 and 2 year old Red Poll steers to John G. Coy. The average weight of the lot was 817 pounds. Mr. Coy will fatten them for market.” — Fort Collins Weekly Courier, October 25, 1900. John G. Coy was one of the founders of the city of Fort Collins and his homestead preceded the military camp that gave the town its name. “J . R . Mason of Masonville, one of Larimer county’s first class citizens and most successful stockmen, was in town on Monday. He says since McKinley’s election there is a material increase in the water flowing in the Buckhorn.” — Fort Collins Weekly Courier, November 15, 1900. President McKinley was elected in 1896. Mason was a Democrat and McKinley a Republican, but the joke doesn’t seem to be too harsh against the President. Perhaps Mason agreed with some of the President’s policies? “J. R. Mason, the sage of Masonville, was a business visitor in the city on Tuesday.” — Fort Collins Weekly Courier, July 12, 1900. “J. R. Mason, mayor, marshal and police magistrate of Masonville, was transacting business in the city today.” — Fort Collins Weekly Courier, September 28, 1904. Mason was frequently praised when mentioned in the paper. But Mason’s good fortunes turned in the spring of 1912. He fell ill and suffered for at least six weeks from an unnamed ailment. He was eventually diagnosed with Bright’s disease (an illness of the kidneys) and he suffered through the summer until, on August 12, 1912, he passed away surrounded by his family and with the help of opiates to numb the pain. His estate was valued at $39,989.85 at the time of his death, which would make him nearly a millionaire in today’s currency. (Weekly Courier, September 6, 1912) Mason was buried in Grandview Cemetery in Fort Collins. Three years later, his wife Mary married Samuel Steele, another local rancher and a long time close friend of the family. J. R. Mason’s children mostly stayed in northern Colorado with the exception of Flora Mae who married a Californian. James and Mary frequently visited their daughter at her home in Southern Cal. But Flora was later divorced and moved back to Colorado. And James and Mary’s son Wesley moved to Chico, California, to farm. The rest stayed in the Masonville area ranching. When they retired from that they moved to Virginia Dale, Laporte, Loveland and Fort Collins. Mr. Mason is a man of more than ordinary intelligence and ability — native and acquired. He has always been a hard-working, industrious man, prudent in the management of his affairs, and through the exercise of a well-balanced judgment has accumulated a comfortable fortune, and is today a splendid example of a self-made man. I used a variety of sources, relying most heavily upon newspaper articles (as found on ColoradoHistoricNewspapers.com), but also piecing together details through census records and other genealogical documents (found through Ancestry.com). Ansel Watrous’s history, as well as his article on the people of Larimer county as published in the paper in 1894, were also helpful connecting dots and adding details. I read through various other articles as well which contributed to rounding out the story in my mind if not in the article above, and so I will include them here as well. History of Larimer County, Colorado, by Ansel Watrous. Published in 1911. Frontier Town, by Peggy Hunt, The Senior Voice, May 2008 as found on the Muley Park Landowners Association website. “Success Swapped for a Trading Post,” from the April 13, 1980 edition of the Coloradoan, as found in the vertical file on Masonville located in the Archive at FCMoD. Also another article from the August 23, 1987 edition of the Coloradoan that was in the vertical file. And various articles from the Fort Collins Courier, the Fort Collins Weekly Courier, the Fort Collins Express, and the Loveland Leader as found in a search using ColoradoHistoricNewspapers.com. Thank you for such a thorough article. I grew up in Fort Collins in the 50’s and 60’s. My family has been in the area from the later 1800’s. My family would like to take Sunday rides through this area. I always had a general idea of the story but this fills it out. You’re welcome! It was a lot of fun to discover details here and there and bring them all together into one story. Thanks for the great article. We live in the house his daughter Edith owned in Loveland. This was a neat connection for us to the history of our home.